A Very Exciting Butorides Rescue! This weekend we had the pleasure of staying with our friends, Dan and Pix, in Seebert. Seebert is a very small rural community located along the Greenbrier River in Pocahontas County. Pix and Dan own a wonderful cabin in the area. On Saturday morning, we decided to head out for an adventure, and we did not have to move the car thirty feet before we found our excitement for the day. Pix looked across at the neighbor’s and said “What is that bird?” There was a long-legged bird walking under a parked car. To our horror, a cat was also observing this feathered beast and actively stalking it! The bird was dragging his wings when he saw the cat and the herd of humans approaching. Dan, Pix, and Judy (my wife who I have appropriately dubbed throughout the years as “the bird nurse” because she has saved so many of the songbirds that collide with our windows) ran to the bird. Somehow they diverted the cat’s attention and Judy whisked the bird into the safety of her hands when he ran into a corner against the neighbor’s porch and steps. 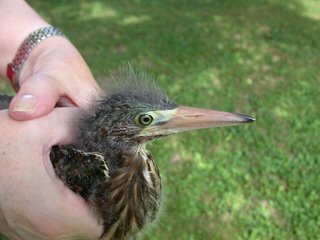 It did not take us long to realize that this was a young Green Heron (Butorides virescens). We immediately took the bird and setup a recovery station on the screened in back porch. After careful observation we decided that this young heron was not injured and needed only a safe habitat. 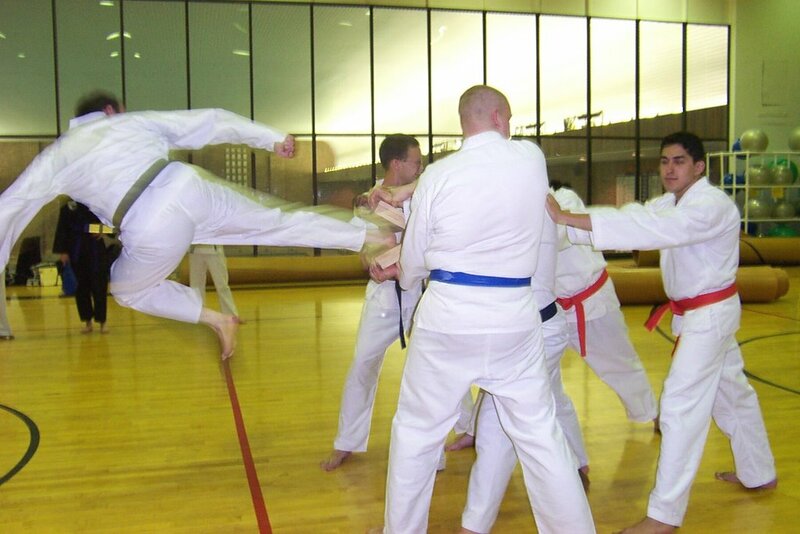 His wing spreading was only a defensive mechanism to make himself look bigger and more formidable. - The Green Heron is one of the few tool-using birds. It commonly drops bait onto the surface of the water and grabs the small fish that are attracted. It uses a variety of baits and lures, including crusts of bread, insects, earthworms, twigs, or feathers. - The Green Heron is part of a complex of small herons that sometimes are considered one species. 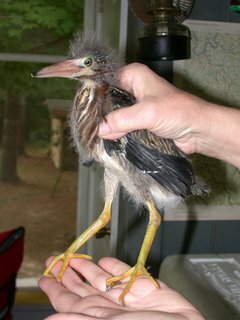 When lumped, they are called Green-backed Heron. When split, they are the Green Heron, the widespread Striated Heron, and the Galapagos Heron. - As is typical for many herons, the Green Heron tends to wander after the breeding season is over. Most wanderers probably seek more favorable foraging areas and do not travel far. But,occasionally some go farther, with individuals going as far as England and France. The photos below show the team of Pix and Judy returning the Green Heron to the backwaters of the Greenbrier River. It has been hot, humid, and dry lately. I would like to share with you the feeding of the Osteichthyes in our pond. Osteichthyes is the large group that includes the world's bony fishes. You can see that we love to feed the fish and the koi are especially engaging. Koi are ornamental domesticated varieties of the common carp, Cyprinus carpio, that originated from China and widely spread throughout Japan. They are very closely related to goldfish, and in fact the style of breeding and ornamentation has become very similar, probably through the efforts of Japanese breeders to emulate goldfish, but they are not goldfish. (However, you will notice that we do have goldfish also in the pond along with the koi.) Koi and tattoos of Koi are traditionally considered lucky. The word "koi" comes from Japanese. The original Japanese word koi simply means "carp," including both the dull grey fish and the brightly colored varieties. The orange and black koi were presents from Nasia Butcher who teaches English in Gilmer County. Several years ago she was teaching in Calhoun County and these specimens were part of the decoration of the Calhoun High School Prom! They were swimming in an artificial pond during the dance. 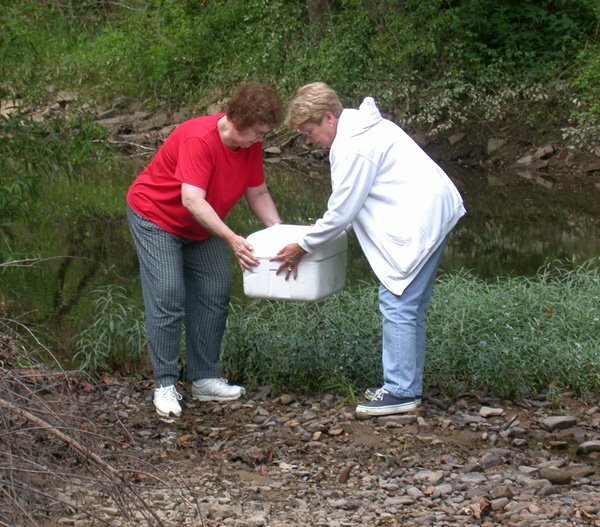 When the prom was over, she donated the orange and black koi to our backyard habitat. They were about 5 inches when they arrived and are now 26 inches. Keep your eyes open to see if you can locate the equally large albino Channel Catfish. This catfish is aggressive during the feeding and has a neat personality. 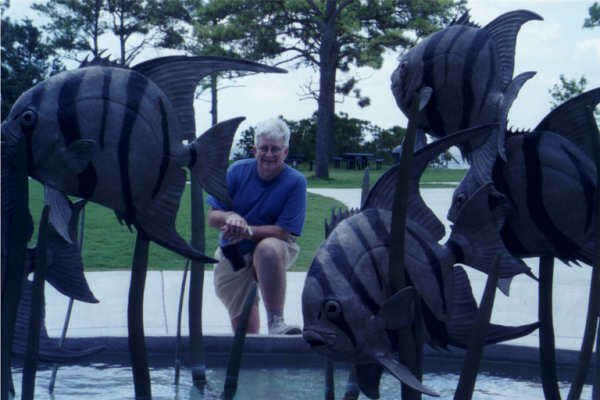 The catfish along with some beautiful white and bluish koi were donated by Peggy Romeo. Peggy is a botanist who taught with me at Glenville State before she moved to Florida. 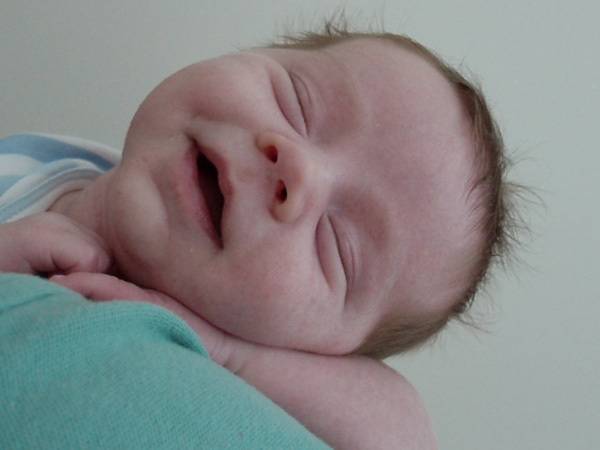 Just had to share this picture of our grandaughter Flora. This photo was taken the first of this month when Flora was playing with some of her friends. 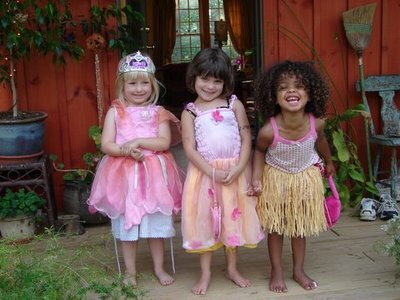 Rachael and John provided a box of dressup clothes and the girls went to town dressing up. They had a ball being princesses, fairies, hula girls, cowgirls, and firefighters. It was really so much fun to watch. From left to right is Flora (3 3/4 years old), Maggie (4 3/4 years old and who shares the same birthdate as Flora - exactly one year apart in age), and Maya (3 1/4 years old). What joy are in their faces! How many of us remember the excitement of dressing up and becoming someone of your dreams? Hurray, it is lily time in our gardens. Yes, the lilies bring on a plethora of colors during this summer period. You can see the great orange display from the tiger lily above. Lilies have been cultivated throughout the ages. In ancient Greece, the lily was the flower of Hera, goddess of woman. 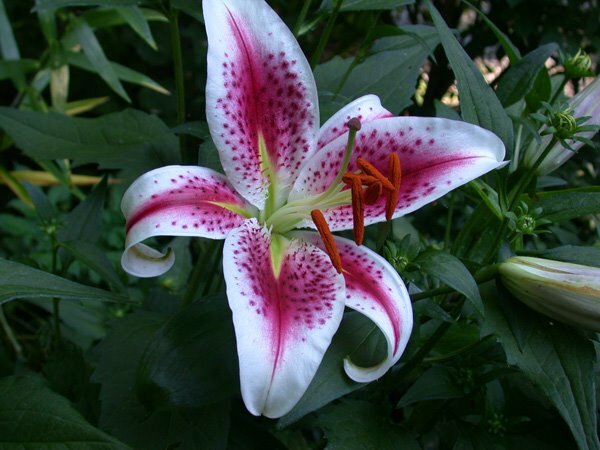 Below is one of my favorite lilies. 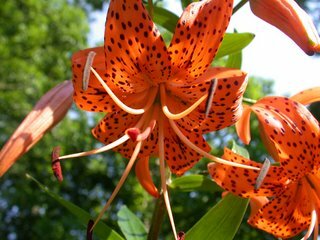 It is the Stargazer Lily (Lilium orientalis). 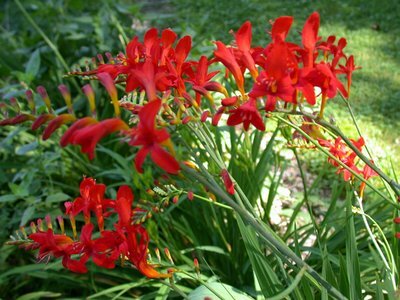 These captivating flowers are known for their irresistible fragrance. Its blossoms present a truly spectacular display. This lily was the flower chosen by our youngest daugther, Sarah, for her wedding. 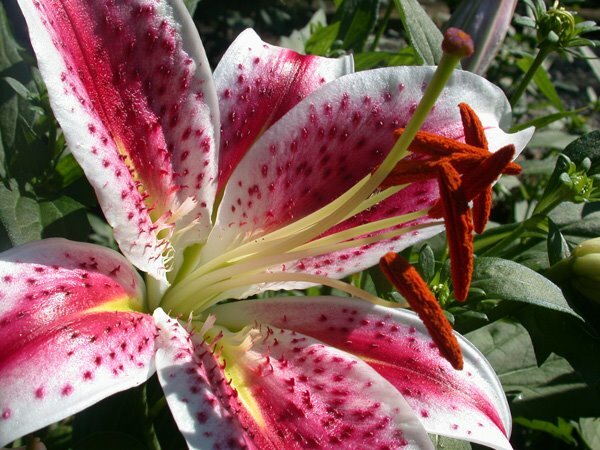 The Stargazer lily was created in 1978 by Mr. Leslie Woodriff, a lily breeder in California. It is an oriental hybrid lily which he called Stargazer because the blooms faced the sky. Is now fairly common all over North America. Beware you cat lovers – the ASPCA reports that this plant is indeed toxic to cats. This lily is so great on the olfactory senses! I always have a joy in persuading others to share in the sweet odor. I have a second pleasure in that when one smells the blossoms, the person always comes in contact with the stamens and the orange pollen stains the nose of the “smeller”. It is remarkable how barely touching the stamens will leave a very obvious orange mark on one’s proboscus. This morning our cardinal nest in the Burning Bush by the porch was certainly active. I watched as Mom and Dad cardinal worked vigorously feeding the little ones. 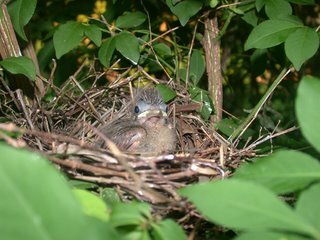 There were three young cardinals in the nest this morning. 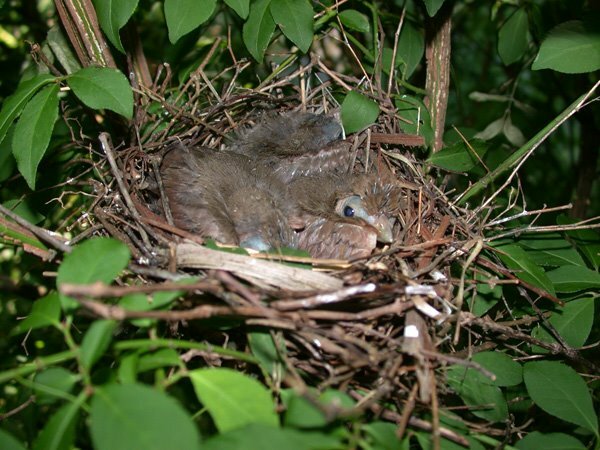 The photo of the three shows them hunkered down tightly in the nest. It is a pile of birds for the small nest. 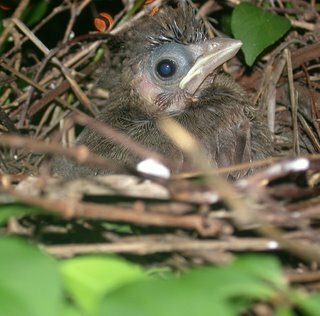 This evening I checked and there was only one bird that had not fledged today. As you can see this lone bird has the developing crest and looks as if he is a rock star getting ready to go on tour. The female incubates the eggs with help from male. The brightly colored male cares for the first brood while the female incubates the second clutch. Incubation takes 12-13 days. Development is altricial (immobile, downless, eyes closed, fed by parents). Young leave the nest after 9-10 days. Both sexes tend young. The brilliantly colored Northern Cardinal has the record for popularity as a state bird. In the United States, it holds that title in seven states. Grandpa Davis who lived in the Western US (out of the range of the cardinal) would always be amazed when the cardinals would arrive at the feeder. For the past couple of days, Grandma Great has been visiting Samuel. 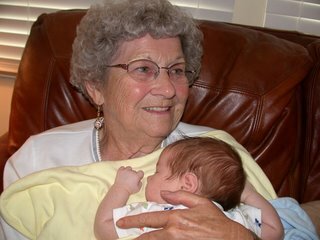 Grandma is now 82 years old and Samuel is 7 weeks. 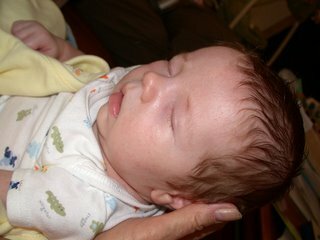 It is an amazing process how the genetic codes are passed down through each generation. There is a little of each of us in Samuel. 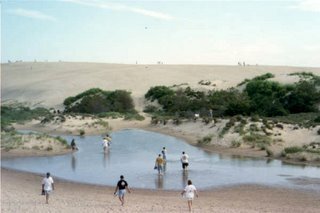 Jockey's Ridge State Park is a 414 acre park and is home to the largest sand dune on the East Coast. It is about 140 feet high. 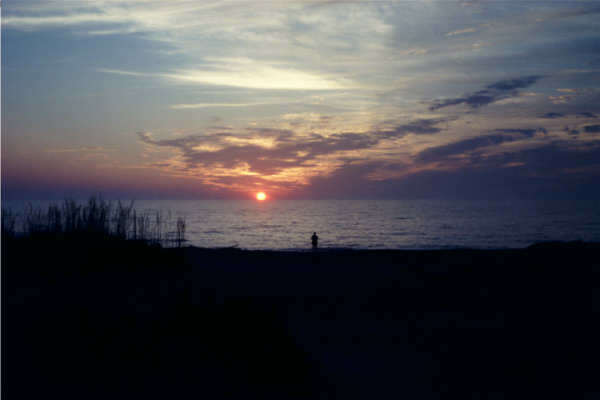 The trek to the top of the highest dune allows a spectacular view of both Nags Head and Kill Devil Hills, as well as the Roanoke Sound and the Atlantic Ocean on opposite sides of the narrow stretch of land. It is an area famous for hang gliding, kite flying, and climbing. 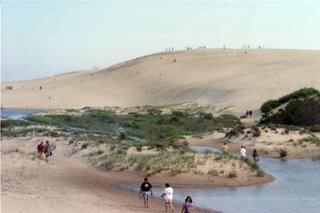 Jockey’s Ridge is an example of a medano -- a huge, asymmetrical, shifting hill of sand lacking vegetation. Jockey's Ridge State Park is a small remnant of a dune system that once stretched for many miles along the coastline. This dune, together with the Run Hill dune, borders Nags Head Woods and shields the fragile maritime forest from wind shear and salt spray. This spot is also very close to my heart. For many years my family would travel with us to the Outer Banks. 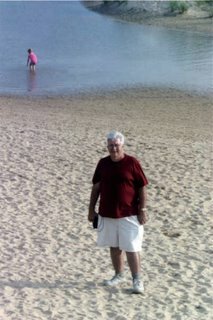 Dad and I would always walk to the top of Jockey’s Ridge. 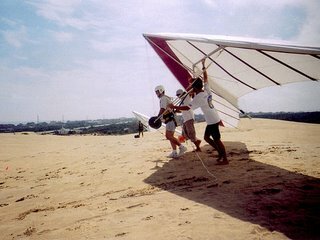 It was those special times when we would share stories, be excited to see the panorama, and be thrilled to watch the hang gliders trying their skills at floating down the dunes on their bright colored “wings”. 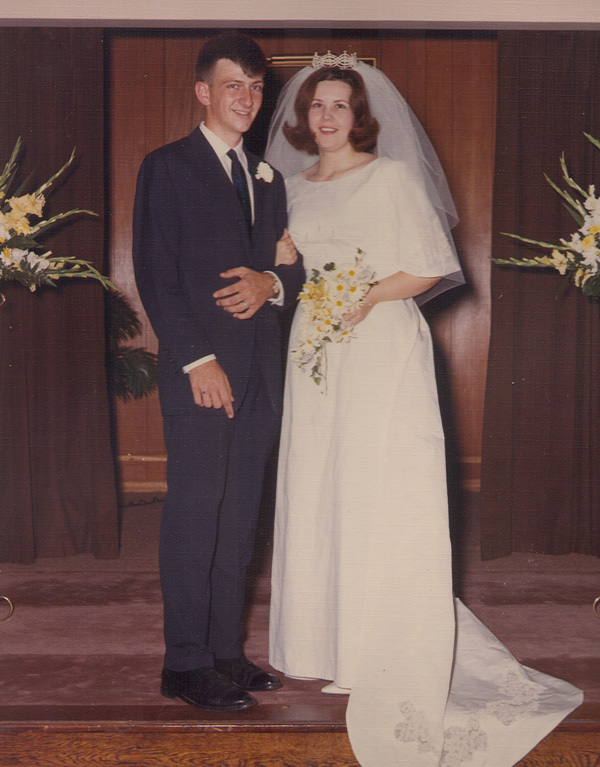 Dad was transferred to heaven on August 1, 1989. Since then whenever I visit Jockey’s Ridge, he is always there so close beside me walking up the dunes. I am here this morning thinking of how fortunate we have been in this life. We have been blessed with family, friends, and many experiences. As mentioned in earlier postings that there are special places that you always hold in your memories. I have written of Red Creek, Dolly Sods, and I have to add to the list the Outer Banks of North Carolina. When our girls were growing up, we vacationed several times in this unique barrier island ecosystem. The Outer Banks is home to many attractions. There are four distinct lighthouses (Cape Hatteras, Bodie Island, Ocracoke, and Carrituck.) along the stretch of the Outer Banks. It is the site of the Wright Brothers first flight, America’s oldest outdoor drama (The Lost Colony), and Jockey’s Ridge State Park, which are the largest sand dunes on the east coast. Our favorite activity on the Outer Banks is birding. 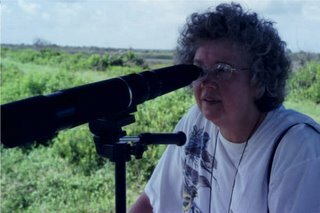 We often go to Pea Island National Wildlife Refuge with our birding scopes in hand. 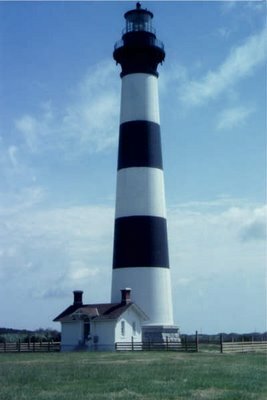 Pea Island National Wildlife Refuge is located between the Oregon Inlet and the village of Rodanthe. Established in 1938 as a wintering sanctuary for waterfowl, Pea Island contains 5,915 acres of coastal barrier island and 25,700 acres of Proclamation Boundary Waters in the Pamlico Sound. 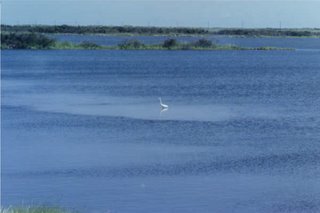 This refuge provides diverse habitat types including beach, dunes, salt marsh, fresh and brackish water ponds and salt flats. Judy and I would usually set up our birding scope along the the Charles Kuralt Trail. 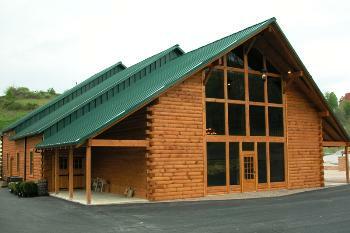 It is a great location! The last time we were there we watched a Roseate Spoonbill. It was many hundreds of miles out of it's normal range. Samuel Alburn Dodson's is now six weeks old and growing like a weed (as we say in Appalachia). I thought it was about time to update you all on our newest grandchild. He is now sleeping most of the night and is doing well. 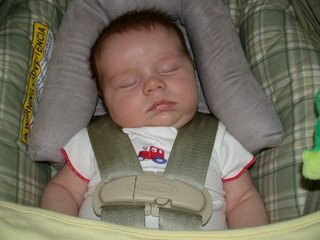 He and his Mom and Dad had their first big outing yesterday. They went to French Creek Game Farm. The parents had a great time. Sam had a great time sleeping throughout the adventure! Don't you wonder what Samuel is thinking about during the time this photo was taken? Two exciting red blossomed plants are currently blooming in the back garden and the hummingbirds are most appreciative. 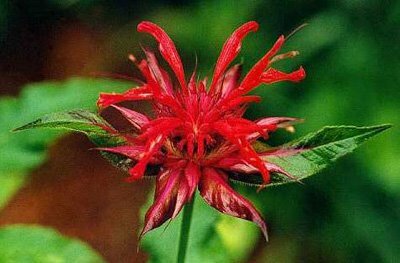 The first seen above is the Bee Balm (Monarda didyma). Bee Balm is a mint and Bee Balm tea is a nice addition to anyone's day! To protest tea taxes, the original colonists drank Bee Balm tea. This plant is native to the eastern US. Crosmosmia (Croscosmia lucifer) is the second hummingbird loving plant now in flower. 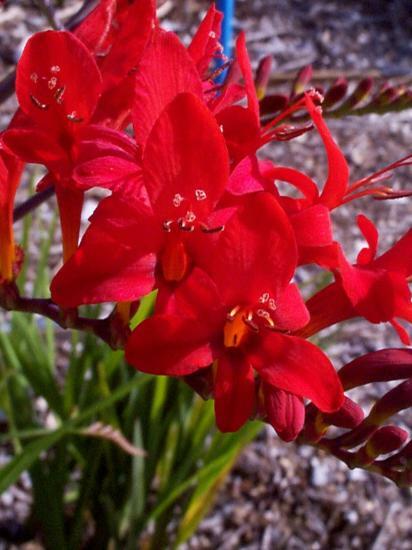 The type we have planted has eye catching reddish flowers that open progressively from the base of the spike. The flowers are carried on double sided spikes that also arch gracefully, reaching some 2 to 4ft tall. 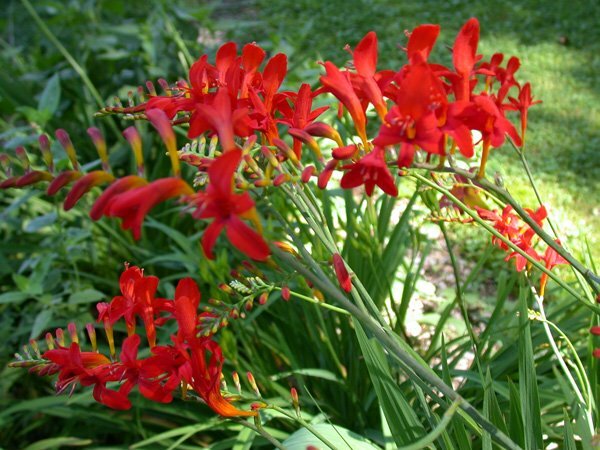 Our Croscosmia is seen below. Thanks once again to Ray and Sue Horton of Burien, Washington, for giving us a start of this great plant! These two plants are unsurpassed in their ability to attract hummingbirds. Trees, Poop, Nachos, and Tai Cuisine! Sometimes I think I need to get out more into the world away from our small hamlet of Glenville. Here is a case in point. 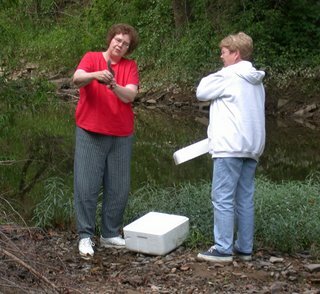 Last week I presented a chemistry in-service in New Martinsville. Traveling through the country I noticed several interesting sights. First there was a trailer along the road that was certainly distinctive. The yard was adorned with a plethora of ceramic figures, but what attacked my eyes were the trees! 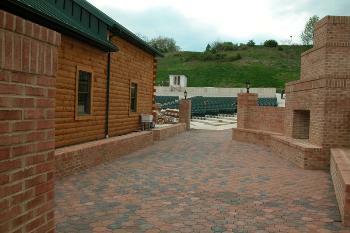 The trees were not whitewashed with the usual lime and water solution, but the owner had used a chartreuse paint. Yes, every tree base was adorned with this brilliant greenish yellow stain. Along another ridge top I noticed a house whose family obviously had a sewage removal service. There parked in the yard were two tank trucks with huge letters adorning the sides of each tank. The first tank was labeled “Poop 1”, and, you guessed it the other was “Poop 2”. It does not take a lot to impress me. I arrived at the motel in fine shape and asked the lady at the front desk, “Where is your favorite place to eat?” She responded with, “The Mexican restaurant- turn left at the first stop light and it is in the shopping plaza.” For you folks that have been married as long as we have, it seems peculiar to eat by oneself. I usually find a newspaper to read so I picked up a complementary copy of USA Today and I was off to devour refried beans and rice! Many years ago I had a Mexican food adventure when I arrived at San Padre Island off the Texas coast. I was once again by myself attending a Marine Biology training session. I checked into the motel and ordered from the restaurant a large Nacho Supreme. My plan was to take it to the motel room. With my Nachos Supreme in hand, I exited the motel’s restaurant. A huge gust of wing blasted me and the Nachos flew up into the air. What I saw before me were BMW’s and other expensive cars decorated with cheese and salsa! I immediately went to my room and prayed for rain. Back to my New Martinsville adventure. Turning into the plaza, I found the restaurant. A large sign on the front said “No checks! No Credit Cards! Open at 6 P.M.” Well it was 5 and, not wanting to wait until 6, I decided to check out my options! Hurray, I noticed a Tai restaurant in the same plaza. Judy and I love to sample different foods and this was opportunity to experience exotic dishes from Southeast Asia. I parked the car and entered the restaurant. There was a long hallway with a receptionist at the end. She was very pleasant and she said, “How may I help you?” I said, “A table for one, please”. 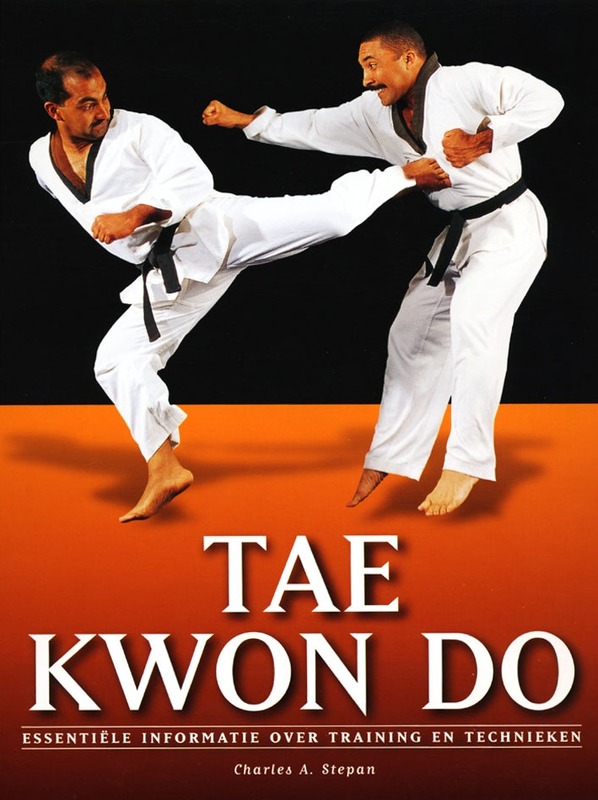 She looked at me in a strange manner and then smiled and said, “Sorry, we are a martial arts studio!” Ok, the neon sign on the door did say “Tae Kwon-Do”. I guess I was thinking “Tai Kwon-Doughnuts”! You see what happens when I leave the wife at home? 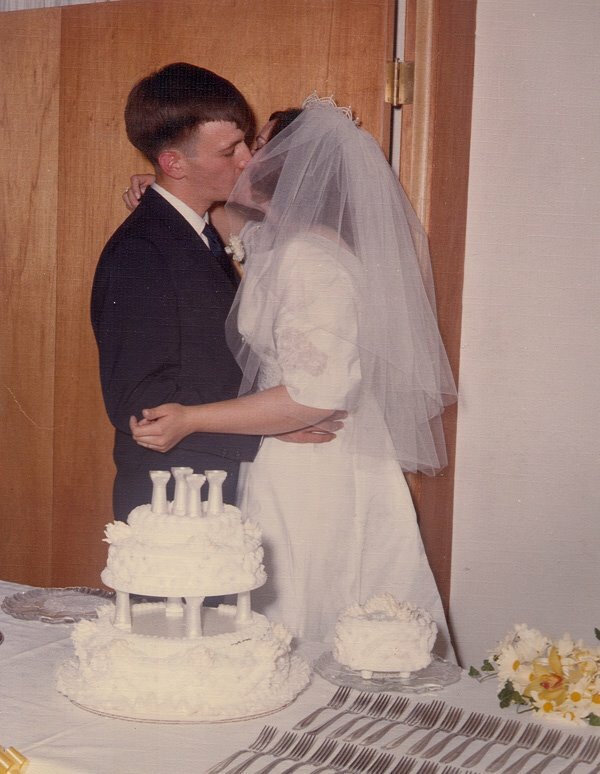 Rick K. on our 39th! It was a fun evening. 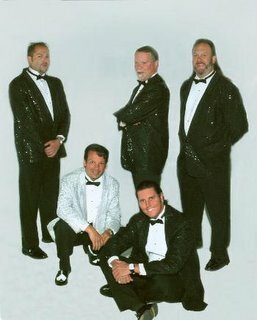 The Rick K. show (Rick K. and the Allnighters - http://www.rickkandtheallnighters.com/ ) was a virtual hit parade of popular music spanning 50 years. The evening featured 1950’s doo-wop, Beach Boys and Motown, to classic pop-rock tunes of the 1970’s, 80’s and 90’s, rock n’ roll. 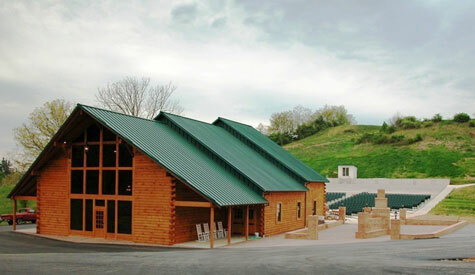 Rick K. formed the group fifteen years ago in Morgantown, WV. They have performed over two hundred and fifty shows in eighteen states during the past two years alone! You would have been proud of us - doing the arm movements to YMCA like experts. We certainly enjoyed the performance and tickets were only nine dollars each. It was a special evening shared with a special lady! 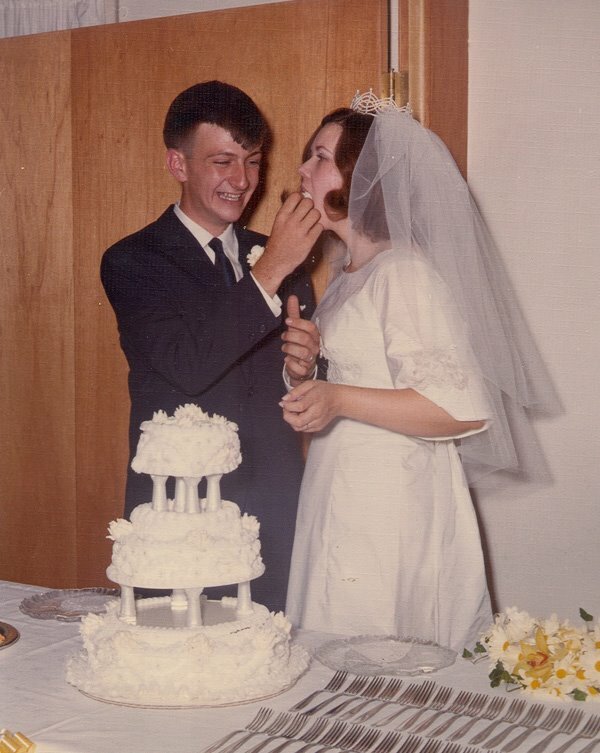 These photos were taken on July 2, 1967. What a joy marriage has been for us! It is so great to find a person that you can share all the adventures that life has to offer and also be the best friend a person can ever image. 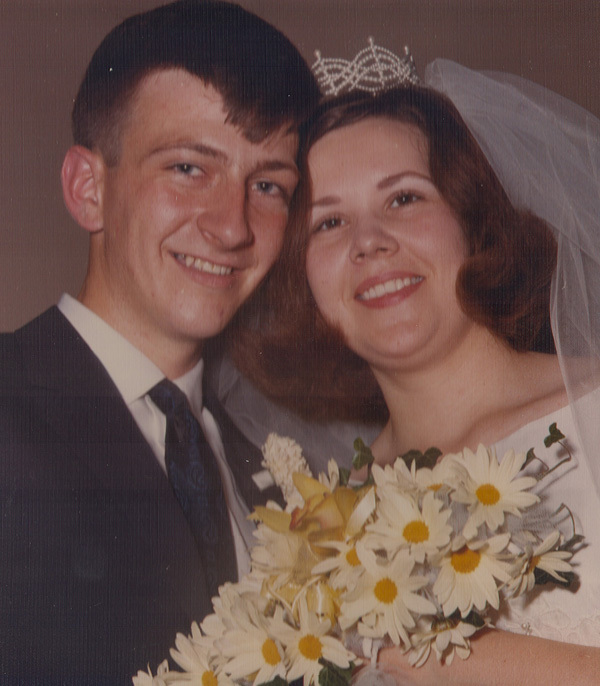 Even in the face of sickness, we have had such strength walking life’s path together. Judy, you are a joy and I am so blessed to have you as a life mate!